The National Jurist has named Julian, North Carolina-native Emily Scotton (JD ’18) among 20 “Law Students of the Year” in its Spring 2018 issue. The story was written by Katie Thisdell and published on Feb. 22, 2018. It is the third year the magazine has created this distinction and the third year a Wake Forest University Law student has been recognized among the nation’s top law students by the magazine. Scotton is the only law student from North Carolina to receive the honor in 2018. Scotton is thrilled to have received the award. Huntsville, Alabama-native Sarah Saint (JD ’17) and Charlotte-native Carson Smith (JD ’16) were recognized as “Law Students of the Year” in 2017 and 2016 respectively. Emily Scotton, a native of Julian, North Carolina, is a graduate of North Carolina State University where she earned a bachelor’s of arts in political science and a bachelor’s of arts in Spanish language and literature. She also minored in nonprofit studies. She is a Wake Forest University School of Law JD Candidate for the Class of 2018. Emily Scotton is an exemplary model of pro humanitate scholarship and engagement. 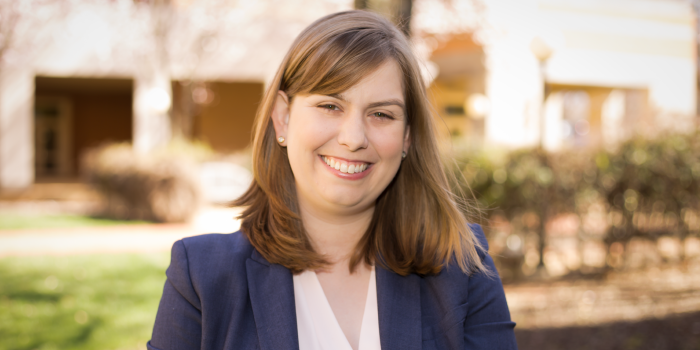 Emily spearheaded the Family Preparedness Project, a new initiative led by the Wake Forest University School of Law Pro Bono Project that seeks to provide durable powers of attorney for North Carolina residents who may be at risk of deportation. As founder and coordinator of the Family Preparedness Project, Emily helped organize client appointments, a dozen bilingual student volunteers and supervising attorneys and faculty members, who gathered at the Downtown Health Plaza in Winston-Salem over the course of four evenings in April 2017. The Downtown Health Plaza is a frontline provider of primary care to the city’s medically underserved. Using a training module and a forms packet provided by the North Carolina Justice Center, law students met with immigration clients to prepare documents under the supervision of local volunteer attorneys, including Dean Suzanne Reynolds (JD ’77). These documents included durable powers of attorney, power of attorney to make educational decisions about children, authorization to consent to health care for a minor and a DMV power of attorney. Wake Forest School of Law alumni Jessica Bell (JD ’05) and Matthew Phillips (JD ’06) volunteered their time and estate planning expertise to provide an orientation to project participants and to train student volunteers. Professor Taylor added Emily connected with the administrators at the Downtown Health Project not just to find a place to provide the service, but to find a place potential clients would be comfortable visiting. In light of its success, the Family Preparedness Project will continue in the Spring of the 2017-2018 academic year. When Emily is not engaged in her own legal studies, her focus is on helping other people, specifically immigrants. From May to August 2017, Emily worked with battered immigrant women as an Immigration Law Intern at Ayuda in Washington, D.C., where she helped with U Visas, U Visa Adjustment of Status, VAWA Cancellation of Removal, DACA Renewals and Notario Fraud issues, among others. And from May to August 2016, she served as an Immigrant and Refugee Rights Intern for the aforementioned North Carolina Justice Center, where she conducted legal research, drafted legal memos, responded to discovery, composed legal briefs, and conducted client meetings. Prior to law school, Emily volunteered at the FaithAction International House in Greensboro, North Carolina, where she was an Immigrant Assistance and Resource Center Intern and assisted English and Spanish-speaking clients in navigating available social services. She also volunteered for two years as a Spanish Interpreter/Translator at Ahora en Raleigh (VOLAR), a service organization run through the Department of Foreign Languages and Literatures at N.C. State University. Emily has a paid internship lined up with Chapman Law Firm in Greensboro for spring 2018, according to Professor Taylor. On top of her extensive pro bono reach, Emily is a dedicated and successful law student, earning grades that have kept her consistently in the top half of her class as well as a CALI Excellence for the Future Awards in Appellate Advocacy. She has also worked as a teaching assistant in Legal Writing, Analysis, and Research 2016-2017 and Appellate Advocacy Fall 2017. In addition to her work with the Family Preparedness Project, as a member of the Pro Bono Honor Society Emily provides further service to Wake Forest School of Law and the greater community as Immediate Past Co-Director of Teen Court and a participant in the Naturalization Pro Bono Project. She is also a staff member of the Wake Forest Journal of Law and Policy and a member of the Wake Forest Law Moot Court, for which she competed at the Gabrielli Family Law Moot Court Competition as a team member. Emily recently had an article published, “Not Free to Speak: North Carolina’s Language Access Past and Progression,” in the Wake Forest Journal of Law and Policy (2017).